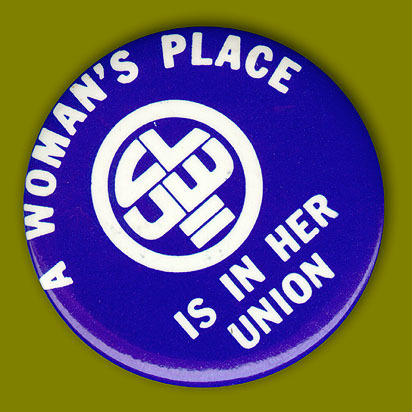 Coalition of Labor Union Women (CLUW) button, 1974. CLUW was organized to highlight special demands of women in the labor movement including greater representation in union leadership, access to higher skilled, better paid jobs, and the elimination of the wage differential between men and women workers. The button's message satirizes the old expression, "A woman's place is in the home."